View of Pictish symbol stone bearing arch symbol. 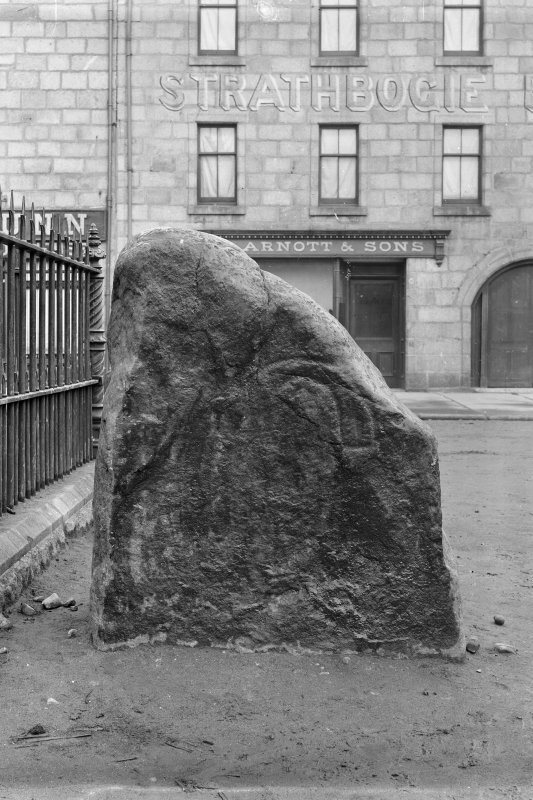 Original negative captioned: 'Sculptured Stone in "The Square", Huntly April 1905'. Present location: in the market square at Huntly. Evidence for discovery: this is one of two stones surviving of a former circle, the rest of which was removed in 1862. The symbol stone was first recorded by Stuart around 1850. Present condition: very weathered with surface flaking. This irregularly shaped slab may once have been taller. Roughly pecked on one broad face is a plain arch. No trace survives of the double disc mentioned in ECMS, nor is it shown on the drawing there. References: ECMS pt 3, 166; Fraser 2008, no 24. Visited by OS (EGC) 22 September 1961. 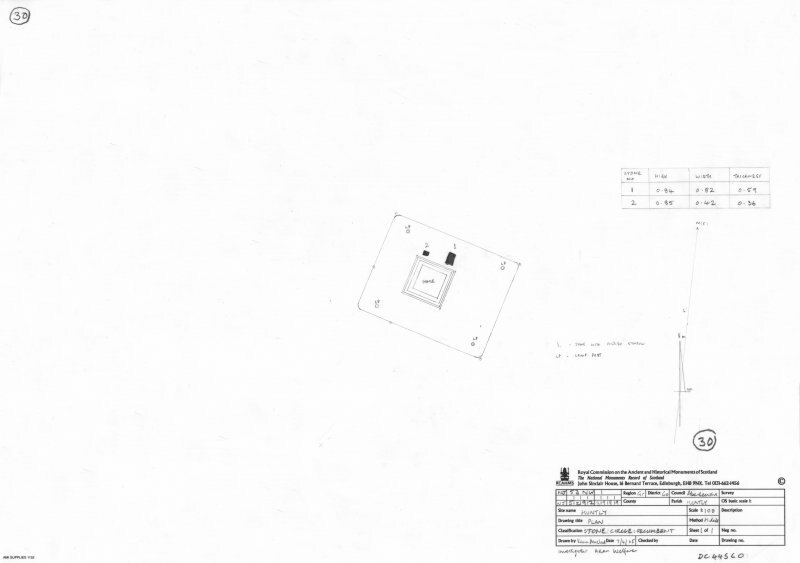 NJ 5292 3999 The two extant stones are located as described in authority 4 and are 1.0m high. The SE stone bears the horse-shoe symbol. Not to be confused with symbol stone from Huntly, Leys of Dummuies (NJ 558 376), for which see NJ53NE 6. For Statue of the Duke of Richmond, see NJ53NW 108. See illustration of stone and markings. The two Standing Stones of Strathbogie have been placed against the pedestal of the statue of the late Duke of Richmond in the market-place at Huntly. One of the stones bears part of a horse-shoe symbol. The two stones now left are not in situ. The Standing Stanes of Strathbolgie, a circle 40 to 50 feet in diameter, of six stones stood 'within the site of the town of Huntly'. Five of the stones erect averaged 4ft 6ins in height, and the sixth 'a very large stone, was lying in front of two.' There is record of a Court being held at these stones in 1557. All but three of the stones were removed when the Duke of Richmond's statue was erected. The third stone used to stand 'close by a house flanking the east side of the southern half of the Square'. In the market-place at Huntly stand the two standing stones of Strathbogie, one of which is Pictish. They are placed against the pedestal of the Duke of Richmonds statue. Huntly No. 1 is an irregular block of whinstone 1m x 0.76m x 0.45m. The only remaining decoration is part of an incised horse-shoe symbol. Visited by R Jones 1980. Symbol now all but invisible. The monument comprises the remaining members of a group of 6 standing stones, one of which is decorated with a weathered symbol. The monument was scheduled in 1935, but the documentation was defective, and is remedied by the present rescheduling. The 2 standing stones that survive set into the ground on the N side of the Square in Huntly are all that remain of the Standing Stanes of Strathbogie, which are recorded as having at one time comprised 6 stones forming a circle, 40-50 ft (12.2-15.25m) in diameter. There is a record of a court being held at the Stones in 1557, and in 1594 they were the rendezvous point for the Earls of Argyll, Huntly and Errol on the eve of the Battle of Glenlivet. All but 3 were removed when the Duke of Richmond's statue was erected in 1862, the third (now lost) having survived for a while close by a house flanking the E side of the S half of the Square. The 2 surviving stones stand adjacent to the N side of the base of the Duke of Richmond's statue. The eastern stone is an irregular block of whinstone (1 x 0.76 x 0.45m), decorated with an incised horse-shoe symbol, which is now virtually indistinguishable. Information from Historic Scotland, sheduling document dated February 1997. Class I symbol stone - Huntly 1 - showing a horseshoe over a double-disc. 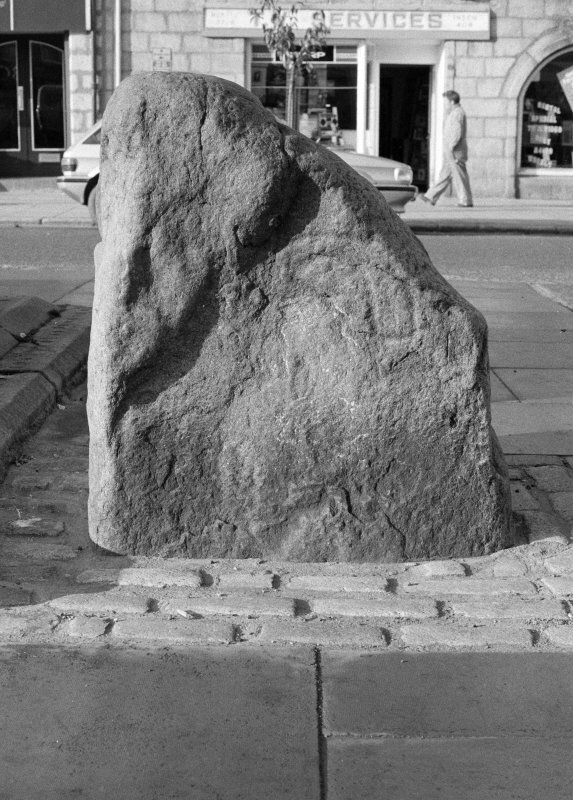 The two stones standing immediately north-east of the statue of the Duke of Richmond in the Market Square of Huntly have been listed as remains of a possible recumbent stone circle (Burl 1976a, 351, Abn 63; 2000, 421, Abn 64; Barnatt 1989, 288, no. 6:55), though Ruggles has noted that the evidence is tenuous (Ruggles 1984, 56 note g, 59; 1999, 186, no. 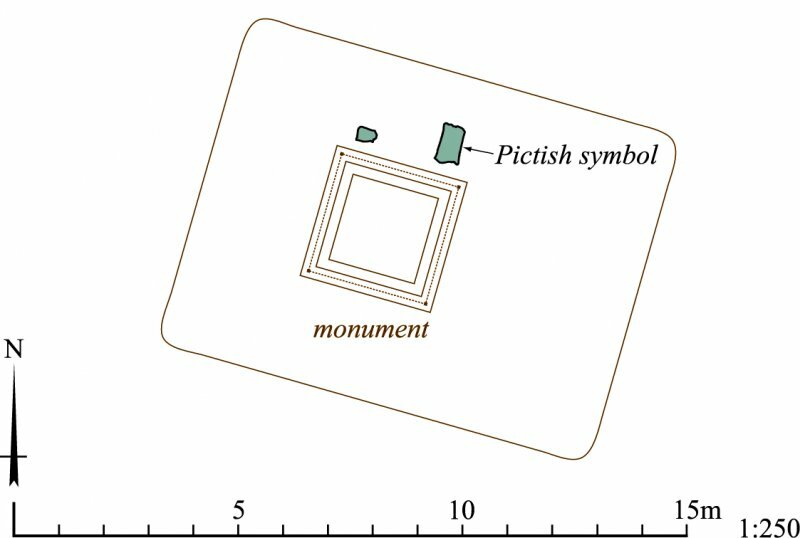 30, 266, n 5); one of the stones also bears an incised Pictish symbol (Fraser 2008, 24, no. 24). Popularly known as the Standing Stanes of Strathbogie, they were an important landmark before the planned town grew up around the square, not only figuring in a well-known 16th century ballad The Battle of Balrinnes, but also as the scene of court proceedings held in February 1557, ‘apud lie Standand Stanis de Huntlie’ (Stuart 1856, vi note; 1867, xlii). The only description of a circle, however, was gleaned by Coles from James M’William of Greens of Glenbeg, Glass. As presented by Coles, this purports to be a firsthand account, the key passage reading: ‘Mr M’William recollects seeing six Standing Stones, none remarkably tall, the average being about 4 feet 6 inches [1.4m]; five of these were upright; one other, a very large stone, was lying in front of two. This I take to be the Recumbent Stone fallen forward. Judging by the position of two of the Standing Stones, the diameter of the Circle was between 40 and 50 feet [12m–15m]; whether the area was quite circular or not, my correspondent does not remember. There appeared to be no rising in the centre.’ (1902, 569). Coles seems to have been uncharacteristically hasty to conclude that these were the remains of a recumbent stone circle. Had he consulted Thomas Shier’s plan of the town in 1823 (NAS 2270), he might have questioned his correspondent more closely, for this shows only two stones, presumably those still there today. The census records for 1901, on the other hand, record that M’William was only 62. Although another of Coles’ correspondents, Miss Gray of the Brander Library, informed him of a third stone ‘close by a house flanking the east side of the southern half of the Square’ (Coles 1902, 570), it seems unlikely that there had been six standing stones in the square during M’William’s lifetime. At best he was relaying received wisdom, and its reliability can only be judged on his knowledge that one of the stones bore incised symbols, though he was apparently unaware that this was one of those still standing in the square. His belief that ‘the stones would have been all removed when the Duke of Richmond’s statue was erected , had it not been that an antiquary interfered’ (ibid 569) relates to the survival of the last two stones, not to the demolition of the original megalithic monument. That had probably taken place long before, as he put it ‘when the Rawes of Strathbolgie were being built’ (ibid); the grid of streets in Huntly was planned in 1776 and, while most of the buildings around the square date from the 19th century, several are 18th century. In all likelihood this is the site of a stone circle, but it is unlikely that either of the two stones is in its original socket. Whether it ever had a recumbent setting will probably never be known.